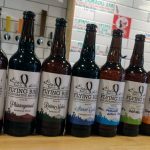 Well it’s been an increasingly unquiet month at the Flying Bike, your local co-operative brewery, here in the heart of Greenwood, now that the clouds have begun to part, and the people are out and about a bit, rubbing the hibernation slumber from their eyes, and thinking it might be time for a beer. Well they’re right! It’s time! 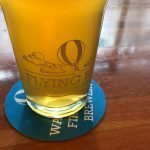 Let’s thank the women of the Flying Bike who got together to brew our new “We Can Brew It” Ale, in honor of the Pink Boots Society, an organization dedicated to encouraging women in craft brewing. 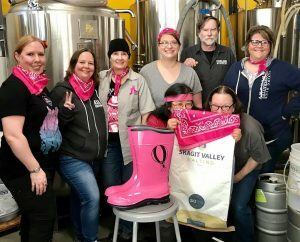 Pink Boots invites brewers all over the world to brew a special beer on or around International Women’s Day, and this is our third year participating. The women of the Bike chose to feature grain from our local craft maltings, Skagit Valley Malting. The hops are there, but if you’re thinking of something deeply mysteriously maltily scrumptious, ask for the We Can Brew It. And since you’re a co-op member, thank you: you brewed it, too. Thanks too, to everyone who’s helped make our new Opiny the Yelper New England-style IPA a great success, along with its swimmy cousin, the Mr. Whale Hazy New England-style Pale. This was our first concerted foray into this style, and it won’t be our last, because, let’s face it, these beers are delicious. We’ll be playing with new- and old-fangled hops in these hop-centric beers, and learning together as we go. Are you in? The fourth in our kettle-sour series has debuted, fermented with a Belgian saison yeast and featuring peach puree from Oregon. The consensus so far is that it’s a winner. What do you think? And don’t neglect the “Fall Forward” Spring Bock. A little advice from your brewer. So what do you say? It’s spring. Shall we roll up the doors?